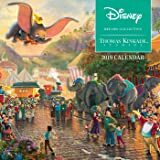 The Thomas Kinkade Studios: Disney Dreams Collection 2019 Wall Calendarâ€‹ brings to life classic Disney characters set with traditional Kinkade images. 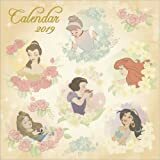 Each monthly spread of this calendar features a full-color image such as Lady and the Tramp or Dumbo, along with new images like Beauty and the Beast Dancing in the Moonlight or Cinderella Dancing in the Starlight. 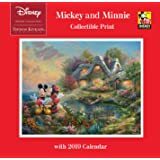 Also included in the calendar is a September through December 2018 spread. 5つ星のうち2.0Was really looking forward to this- and I’m sad! 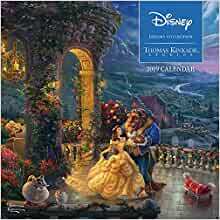 I’m a huge Disney fan and love Thomas Kinkade’s art as well, so you can imagine my excitement to spot this calendar. I ordered it and it arrived perfectly on time, but I wasn’t able to open it until today. That’s when I realized my calendar came damaged. Is it still usable? Yes, and I will be using it regardless. But I’m more than a little heartbroken, and will definitely not buy again. 5つ星のうち4.0Beautiful, one tiny flaw tho.. This is a beautiful caledar, it arrived very quickly and it’s gorgeous. The one downside for me personally is that when there is an extra day in the month it just has this “24/31” instead of cutting the box diagonally in half like most calendars do, so basically it’s just one box with 2 dates in it with no separation. 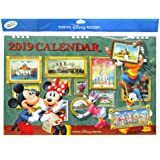 This is the only bad thing I have to say about this calendar because it’s beautiful and perfect other than not having the split dates in the boxes. My daughter's pediatrician has these paintings on canvases in each patient room and I just loved them! 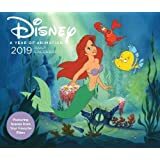 So when i saw i could get a calendar, i just had to get it! It's a good size to be able to see image details. I also write on my calendars and am happy that the boxes are large enough to write how I normally do vs having to write itty bitty. Lastly, the calendar has the phases of the moon which I though was a nice touch since not all calendars have that.